Oeh, the end of the complete European pack is getting near! Can't wait to have Switzerland, Sweden and Ukraine! AND NEWS UPDATES: All European countries are now playable in the game! This seems really cool! I am new to all of this, so please excuse my ignorance. Are there instructions somewhere? I don't see anything in the first post or the link and I want to make sure I extract everything to the proper location, etc. So it's my understanding that this simply makes Serie D and its cup playable, but does not add any players, correct? Also, there is currently an issue (not sure if it's a bug or just incorrect data) in the game where promotion/relegation between Serie C and Serie D is wrong. Does this edit you've created handle pro/rel accurately or does it just plug into the current inaccurate system? If the latter, is there a way you or I could fix this? Also, has anyone actually played in Serie D using this? Does it work okay? Any potential issues I should be aware of? I might download it and load it in the save but actually start my save in Serie C instead, not sure. I add a little help of Chile. 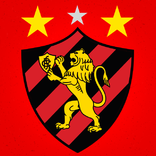 Champions and runnerup to Libertadores group phase. 3rd Qualifying round Libertadores. 4th to 7th to Sudamericana cup. 15th and 16th relegated. 1st to 5th goes to promotion playoff group. (1st gets 5 pts, 2nd 4pts, 3rd 3 pts, 4th 2 pts and 5th 1 pt) . winner is champion and promoted. 2018: 15 teams, 28 matches. 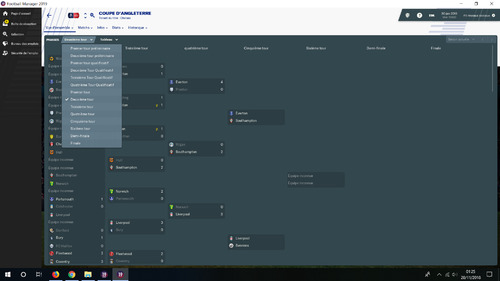 1st to 4th to promotion playoff phase group , 1st champion and promoted, 2nd promoted. 14th and 15th to relegation playoff vs 3ERA B semifinals losers. 2019 and then: 18 teams. 34 matches. 1st to 8th to playoff round, two finalists promoted, winner is champion. 17 th and 18th relegated. 1st and 2nd of group phases goes to promotion playoff with the 2 best thirds. Both finalists promoted and semifinals losers faces 14th and 15th of upper div. 1st and 2nd of group phases goes to promotion playoff group and 1st and 2nd promoted. 10 matches. 1st rnd, Primera B vs Segunda/Tercera, 2nd rnd, Primera vs winners. Winner goes to Libertadores qualifying round. Primera: 16 teams. 30 matches . 5 foreigners, sub19 50% of minutes. Primera B: 16 teams. 30 matches . 5 foreigners, sub19 50% of minutes. Segunda: 16 teams. 30 matches . 1 foreigner U25 div. Tercera A: 16 teams. 30 matches . U23 div. no loans. Tercera B: 36 teams. 3 groups of 12 (north, central north, central south, south) 22 matches. . U23 div. no loans. 12th of each group relegated. Champion goes to Libertadores qualifying round. Hello Claasen, I've simmed a season using your England database and everything works perfectly except the FA cup. No fixtures are scheduled for any division. The draw dates are shown and clubs have the FA Cup in their competitions panel, but no matches are actually played. I've tested two further saves and the same thing happens. I added advanced nation rules to the default database in order to compare them with the ones in your database and try and isolate the issue. I can't see any mistakes in the rules you created. However, SI have included 4 sets of rules for the FA Cup whilst your update includes only two. Screenshot attached. I assume that rules with FMM in brackets (whatever that means) are required and this is causing the issue? Don't worry about re-doing this since I know you're probably busy. The Regional First playoffs were perfect! I can re-create those now and just leave the FA Cup on the default rule settings. @ShiftyPowers For Romania 4th division, no sorry, there is almost 50 leagues I believe.. and the database has not all the clubs. @Weston All is OK with my update for the promotions/relegations with Serie C. The update add no players. Extract the file in the folder editor data. @ucdark OK Thank You. I will see when I will do South America. @toiletfootball You don't have the right version because everything works well for me! And FMM is for Football Manager Mobile. So it's useless. - Netherlands: fix play-off 1st/2nd division and VAR. Hi Claassen, is this bug the one I told you about? If so, will I have to start a new save in order to get it right? Merci pour ton travail, c'est vraiment super ! Thank you for the reply re: England. The FA Cup error is in the version linked on 24/11. The version in the updated OP works fine as you say. Merci Beaucoup. first of all. I can't say how thankful I am for your terrific work! This is why I love to play FM and if you ever consider setting up a donation option, please let us know! Just a quick question about your updates for already released leagues. Will you upload them in the workshop after a while as well? We can't thank you enough for your great work! Fantastic! Marvelous. Regarding the English file, I can see you have changed Corinthian-Casuals to semi pro, even though they are amateurs in real life. Why is that? @faneitzke : Yes ty for the report, and yes unfortunately..
@Kirk_braunschweig Thanks. And no, I can't upload the improvements in the workshop. It doesn't work for me, I don't know why. @Svartov : Because the 87 others teams of Level 7 are "Semi-Professionnels" in the editor except them. It seemed weird and I did not want to penalize them because of their status. @DMATOS01 South America next week. It's not really penalizing them when they chose it themselves. Because of tradition they have decided to stay at amateur status. It's debatable if they should have amateur or always amateur, but semi pro is certainly not right. And btw, because their contract types are still as before in your file, they can't give players money. So basically in game they work like an amateur club, but have their status set as semi pro which is just misleading tbh. EDIT: I can also see that you changed a club like Basingstoke from pro to semi pro. I understand that you want the clubs to be on a the same level, but when these differences between the clubs are realistic and the same as in real life, why then not keep them? Can it be inserted into this add - on for Serbia and setup for use specified fixtures,as this add-on will not work together with real fixtures. @Svartov: Those are minor things. I will fix if you want for the next release.. Basingstoke status professionnal in 7th level... really ? @Nikola F.M 87 I don't know. There is real fixtures in the original game? If yes, normally, it must work too. I would be very thankful for that. And yes, I know it's minor things, but especially with Corithian-Casuals it means a lot to me, as I'm going to have a long term save with them. I think amateur would be an appropriate status for them. 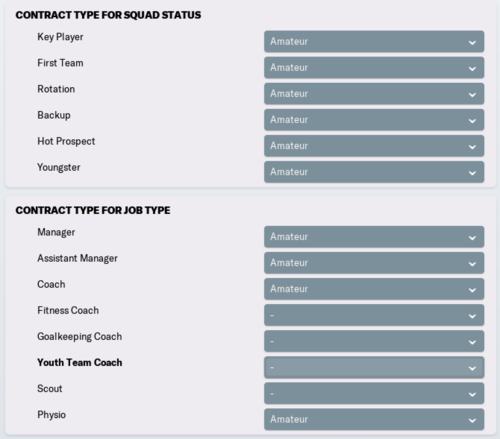 And yes, Basingstoke offer their players and even youth players full time contracts as far as I know. I don't know if it has changed since that though, as the article is from 2016. 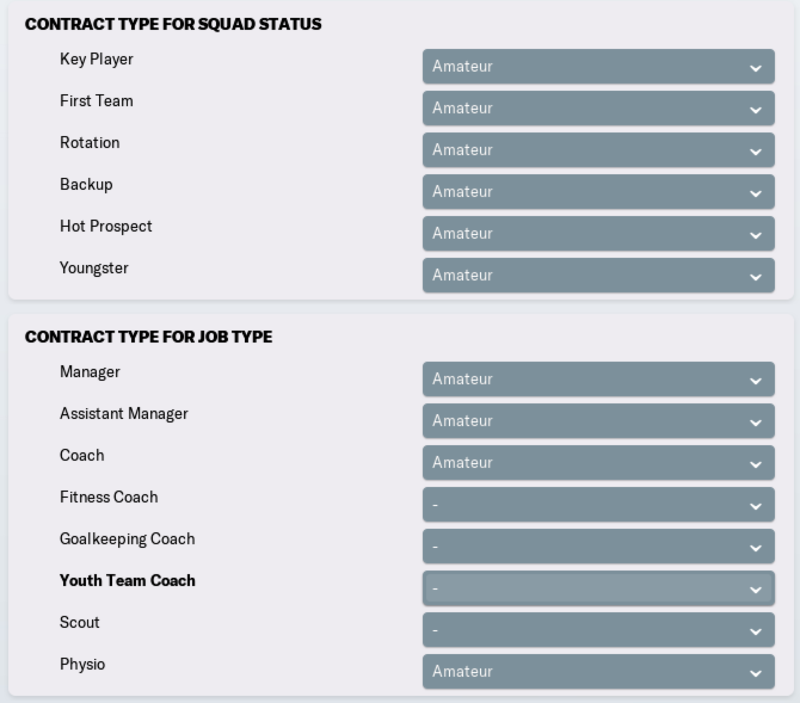 In-game they have a player on full time contract, which indicates that they should probably be set as pro. Maybe with some restrictions under contract types. Work with original game fixtures,but i want to install it to be real fixtures like in real football,so i asked you if it could be inserted in the add-on use specified fixtures. Really loving your work this season. @Nikola F.M 87 Yes, the real fixtures can be inserted in the update, but I would not do it .. Especially since it works only the 1st year! @decapitated Yes, I have lot less time this year. But I think I'll finish Europe tomorrow. And I will start South America tomorrow also and this week-end. Don't worry if there's not the time for Brazil and Argentina. The other 7 countries are more important Which continent will you do after South America? Asia? OK, can it just be insert use specified fixtures﻿,i only need this,and I'll put in real fixtures,i did not even mean it to ask you to work,it if can not thank you for this. But I think I'll finish Europe tomorrow. are you going to add the 21 Association Cups in Germany? Provided you find the time for it. @Oberst : I don't know. Before 2019 I think! @Nikola F.M 87 yes you can ! @Matiasu No, because these competitions doesn't exist in the database, unlike the Austrian regional cups that I did! EUROPE completed : 55 countries done / 55 ! Ukraine: 3rd and 4th division activated. Amator Cup activated. Cup extension (50 teams). Promotion/Relegation play-off between 2nd div. & 3rd div. Great news about the leagues around the world after south america, claassen! Do you plan to make more leagues or at least the same alloys as FM18? Understandable, will be playing regardless. Perhaps I'll move them into Liga III if possible. Thanks again for your work. Can I humbly request that those 3-5 North American leagues include Jamaica? I would normally just carry the old FM18 file over and make do, but I've been running on FM16 till now and I can't extract the old file =(. 16 won't show in 19 even when extracted, I can't extract 18 to XML without the 18 editor, and I've been trying to do it myself for ages with little success... Hoping this is part of your plan anyway. At least most of the world's leagues. Motivation we send you the comments. Hi @Oberst. While you're waiting for Claassen, is there anything that I can add to my NZ league system that will allow you to complete your hexagon challenge?